Evidence Trumps Common Sense: What is the Job Situation in the US, Really? What is the Job Situation in the US, Really? The data do seem confusing though. For example it was reported that April nonfarm payroll employment rose by 115,000 which was substantially below the forecast number of 163,000 and well below the number economists estimate is needed to reduce the unemployment rate. Paradoxically, the simultaneously released unemployment rate was reported to have dropped from 8.2% in March to 8.1% in April. In fact, despite what has been considered anemic job growth, the US unemployment rate has dropped steadily from its peak of 10.0% in October 2009. First one needs to understand the sources of the different sets of numbers. The nonfarm payroll data is obtained by the government surveying approximately 141,000 businesses. However, the nature of work is changing. There are more people working as individual contractors, obtaining jobs through Craig's List, etc Surveys of established businesses might not detect this type of employment. Thus the business survey could underestimate the number of new jobs being created. On the other hand, the unemployment data are obtained through a household survey asking whether individuals are working or looking for work. To me this type of survey would likely be more accurate than the business survey provided that the government can obtain a representative sample of households. However, here there is another problem. The unemployment rate is the ratio of the number of people looking for work divided by the number of people either working or looking for work (the labor force). However, particularly in an economic down turn people may get discouraged and give up looking for work. Thus the unemployment rate can go down even if the proportion of people who have jobs doesn't change as long as some unemployed people give up looking for work. 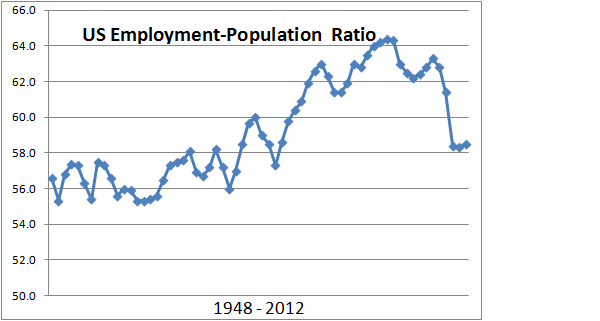 I think a more reliable indicator of the employment situation is the rarely cited employment-population ratio. This ratio represents the fraction of adults who actually hold jobs. This measure is less susceptible to the effects discussed above. Over the period 1948 to 2000 the employment-population ratio rose from 56.6% to 64.4% as the economy prospered and women joined the work force. With the 2001 dot com bust the ratio came down a percent or so but held at the 63% level through 2007. However, the recent financial crisis resulted in the employment-population ratio plummeting to 58.4% in 2009 and there it has remained to this day - 58.4% exactly in April 2012. One would have to go back to 1983 to find a lower ratio. 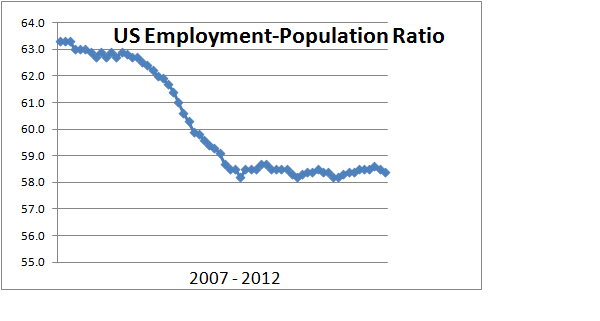 In terms of the employment-population ratio the employment situation in the US has not improved at all in the past three years. In terms of this statistic the proportion of the adult population who have jobs is nine percent lower than it was in 2000 (58.4 - 64.4)/64.4 = -0.093 = -9.3%. I don't think that adults in the US have a lower level of employment now because they are feeling so rich that they don't feel the need to work! It is because they can't get jobs. In another post I will discuss some hypotheses on why the jobs data are so disappointing and what we might do about it.